When I borrow books at a library, I sometimes find scribbled ones. A previous reader marked on an important part or something; although scribbling on public books is not allowed. 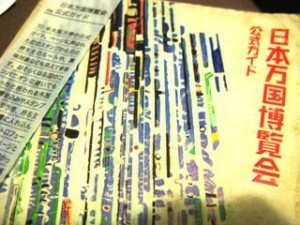 In this article, I want to introduce a scribbled book collector and his collection, which I found in a blog. 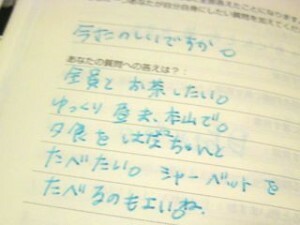 The following is the report of a scribbled book fair held by Mr. Yoshizawa two years ago. Konseki-bon collector, Mr. Yoshizawa in [W:Aichi Prefecture]. What made him interested in unknown people’s scribbling is a love letter he found on a street. At that time, he was making a film but reading unknown person’s letter, he saw the true nature of human. 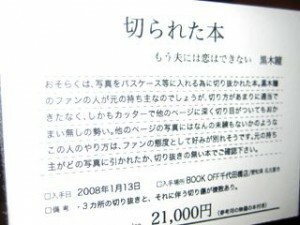 Since he worked at a secondhand book store, he started to collect scribbled books, which he calls “konseki-bon (marked books)”. 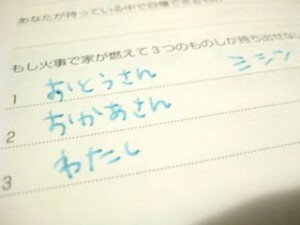 This is a written in Q&A book. “Myself” comes third, it’s kind of heartrending. It’s a collection of photographs of a Japanese actress, [W:Hitomi Kuroki]. It seems the original owner cut some pictures out to put in a wallet or something. 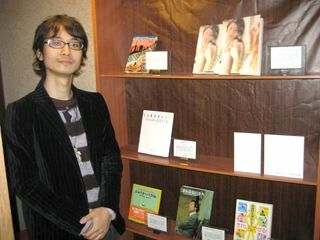 Mr. Yoshizawa is selling the book with his commentary at 21,000 yen (US$228)! Usually a secondhand book store doesn’t take scribbled books or missing pages ones, but Mr. Yoshizawa positively takes those books. As a “konseki-bon” collector, now he can tell which books have scribbles by just looking at a book shelf (wow!). “The value can be decided by me” Mr. Yoshizawa thought and priced so LOL. The next book has an impact too. 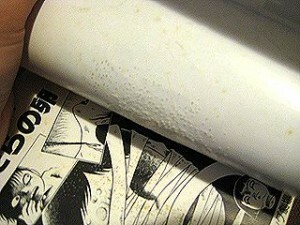 The cover has countless tiny holes; they seem to be made with a needle. 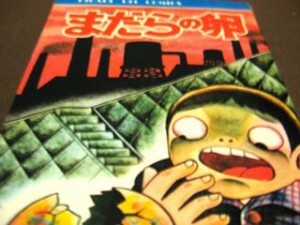 This horror manga has twenty pages of holed page! Mr. Yoshizawa’s comment on the book. 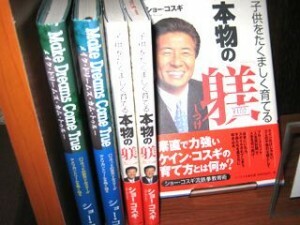 This is a Sho Kosugi’s book. 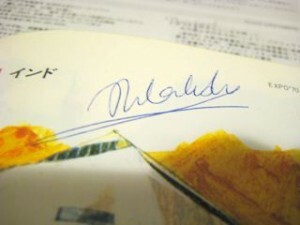 His books always have his seal and autograph. 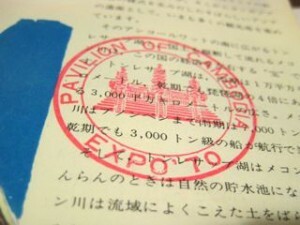 It’s the book of “[W:Japan World Exposition]” held in Osaka in 1970. It’s stamped on the page of the pavilions the owner visited, and autographed on the India’s page. It’s an understandable “konseki-bon” for the general people and seems very valuable. Mr. Yoshizawa also said he wanted to get into a life mark left on a book (maybe like wine stain) or a mark of wet glass. His collection was amazing, especially the needle holes’ one! It surely gives ten times more scariness to the manga. This report was helpful for me to learn how to add value. I think it’s a business field which doesn’t have other competitors; but I wonder he can sell well. Early next month, the “Konseki-bon Tour” held by Mr. Yoshizawa is going to start in Tokyo. I’ve already applied for it!! and I will share the konseki-bon experience with you next month.